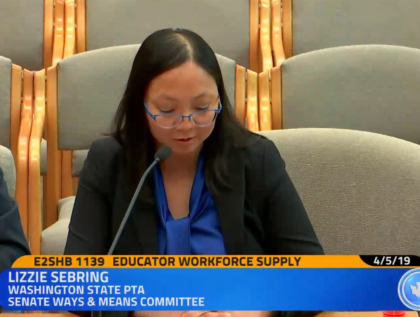 Everett PTSA Council Advocacy Chair Lizzie Sebring testified in favor of E2SHB 1139, the comprehensive approach to recruiting and retaining professional educators, after waiting nearly 5.5 hours! (Gold stars Lizzie!!!) The bill was before the Senate Ways & Means Committee on April 5. The House budget includes funding for various scholarships, stipends and mentoring programs. Read Lizzie’s testimony here.